Thank you. So next time I would rather use IGES or STEP instead of STL. I have one more question. Isn’t it a little bit inconvenient to click all the faces/solids. In stl you usually have just few of them. If you have any additional thoughts and/or ideas feel free to share them in the Feedback or the Vote For Features section of the forum. Thanks a lot and happy SimScaling! This is really helpful . I have still some questions. In simulation and than in result control I want to set Forces and Moments of the wing., but what I have to write under center of rotation? Do I need to go to the CAD system and see where the center of mass is? Take your time. Still I have some issues with simulation. Maybe mesh is not good enough? I successfully ran a simulation, but results are strange. The convergence plot shows that simulation was ok, but if I look at the force plot for the main wing it suggest that something is wrong. At the end of simulation results just explode! Any suggestions why so? Your mesh and setup looks fine, so I think the issue lies with your initial conditions of Turbulent kinetic energy value [m²/s²] (k) and Specific turbulence dissipation rate [1/s] (w). Your values are rather high and you might need to double check on your calculations for these two values. In the meantime you can try to set it to the default values and run to see if still get the absurd force readings. Unfortunately this did not solve the problem.Still after 1300s or so, the results just go mad. Any suggestions from your side? Do I need to change some of the conditions in the simulations? Sorry for the delay @Zaapex! Can you share the latest version of your project along with the name? I saw that one of your projects finished successfully @Zaapex! However I see that there might be an issue with the geometry having some weird artifact as depicted below. Maybe fix that to get a successful mesh of that one as well as splitting the geometry. Now it only consists of 1 solid. 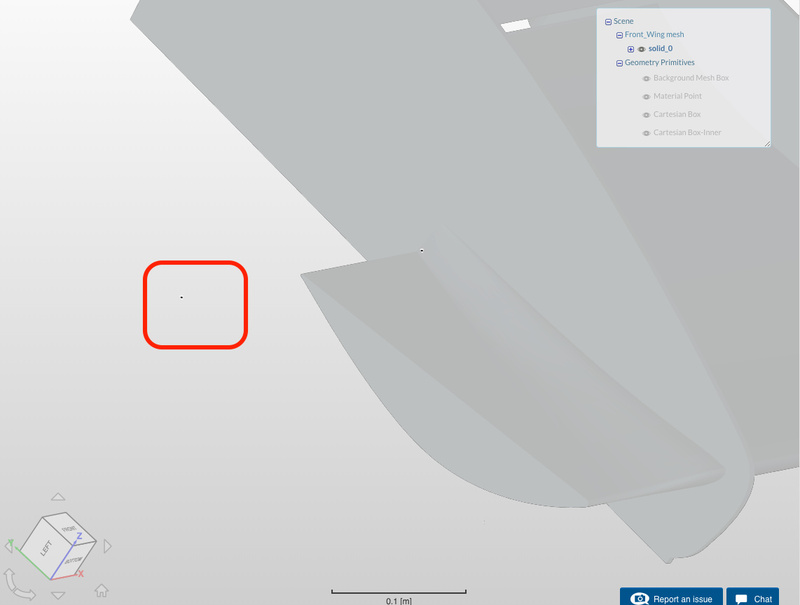 I spotted that failure and I made a new geometry (SW- imported as solidworks geometry). And with that geometry I made a mesh which was fine but the problem occurs in simulation. The simulation finished successfully as far as I can see. Do you still need help with something? If so please let me know! The problem are the results. They are strange. Could you try extending the bounding box in the -x direction and put the component in the middle of the mesh box? I want to see if that causes the exorbitant high velocity. Reducing some of the illegal cells by adapting mesh parameter settings could also be done in the same iteration but I doubt that this causes the messed up velocity. Cheers and keep me up-to-date! I ran a simulation and now it is much better. The results are fine, but now I have lost symmetry. Anyway if I want to know what is the downforce of the wing I have to check Pressure force Z, right? You can have a look at the log file and search the Cl coefficient standing for the negative lift or downforce. You can add a result control item inside your simulation. A good instruction on how to do this has been posted by my colleague @Ali_Arafat: Lift Downforce Calculation Help. Let me know how things go and all the best! I think that I got some decent results and therefore I can move on to another project. Thank you so much for your time.